Carlstadt, New Jersey – December 6, 2018 – Pantone Color Institute, the developer of professional color standards and digital solutions for the design industry named the Color of the Year 2019. A new and exciting change that is about to influence and make our life brighter. Please, welcome Pantone color of the year – PANTONE 16-1546 Living Coral. A beautiful enlivening and life-affirming, shade of orange with golden tones color. I am already falling in love with this color. Simply, its because it reminds me of the beauty of the sea and adventures. Fantastic associations come into my mind when when I look at it. 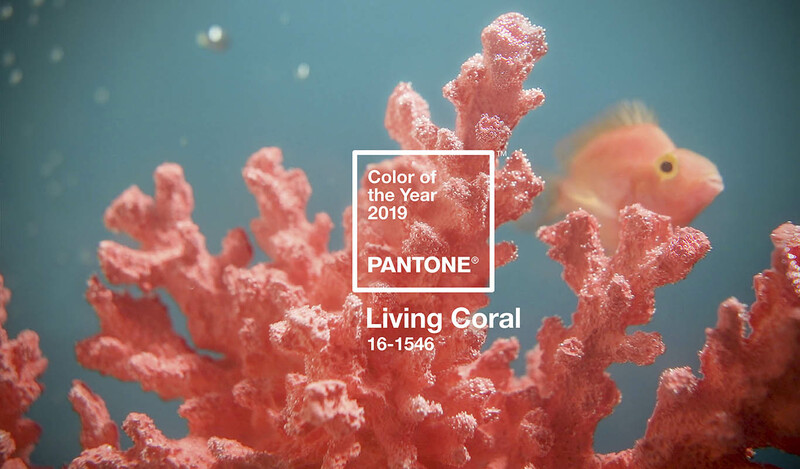 Just as the coral reef is a source of food and is a shelter for marine life, the bright but soft PANTONE 16-1546 Living Coral takes us into its warm and caring embrace, giving us comfort and helping to keep afloat in our ever-changing world. We live in the world overcrowded with digital technologies and social networks, increasingly invading our daily lives. We embraced the new world, and we are using all the opportunities it offers for authentic, immersive experiences that allow us to connect with others and express ourselves. Here comes a sociable and energetic, attractive nature of color PANTONE 16-1546 Live Coral that encourages our light-hearted activity. Symbolizing our innate need for the optimism and the search for joy. Pantone 16-1546 Living Coral embodies our desire for playful self-expression. Reflecting the intricate connection of our modern life, Pantone Live Coral is a caring color that can be found in our natural environment and which, at the same time, has a lively presence on social media and our daily activities. I think this color is exactly what we all need. This new and exiting Living Coral Color also radiates such welcome, familiar and energetic characteristics of flowers originating from wildlife. In its bright, underwater image, this life-giving and sparkling color captivates the eyes and mind. Living in the center of our vibrant and rich ecosystem, Pantone Living Coral evokes associations with coral reefs that provide shelter for a whole kaleidoscope of various colors. Organic hue, Live Coral leaves the strongest impression in digital environments, evoking the same inspirational feelings as in the natural environment. The brightness and cheerfulness of Live Coral Color easily attract an attention in social media and digital design. Lively Coral inspires experimentation and playful self-expression in both men’s and women’s street fashion, as well as we can see it on the catwalks. The warm shade offers comfort and positivity in simple color stories, but it becomes more refined and sparkling in patterns, textures and even monochrome variants. An attractive accent shade, Pantone Live Coral creates a striking contrast with any color spectrum. A life-affirming shade suitable for any skin tone, Pantone Live Coral brings the beauty of natural color into the blush, eyeshadow, and lipstick. Free, playful makeup ideas also grow stronger with Live Coral, which, being the center of a kaleidoscope of colors, encourages experiments with palettes, textures, shimmers and glitters. By the way, Pantone’s official beauty partner Butter London Launches Living Coral Makeup Collection for Pantone’s 2019 Color of the Year. A collection featuring a cream blush, a lip gloss, and nail polishes, and I think I need more details on that. So far it looks fantastic. What do you think about the Pantone Live Coral inspired makeup idea? Live Coral organically fits any product for any gender and age. Textured materials and friendly colors such as the Pantone 16-1546 Live Coral appeal to our need for products with human and eye-pleasing characteristics. Used as a bold statement in home decor ideas, Live Coral contributes to capturing impressions, especially for pop-up-and-play installations and interactive spaces. As a tactile and humane color, in fleecy carpets, cozy blankets, and lush upholstery, Living Coral Pantone creates a feeling of warmth, peace, and a care in the house. Thanks to its enthusiastic nature, Living Coral Pantone adds a powerful color effect to any room, whether in the form of decorative accessories, tabletops or on the wall. Live Coral is perfect for packaging. Warm and friendly, this life-affirming shade invites the buyer to take the goods off the shelf. Among all the other joyful activities associated with the symbolism of Living Coral, is Traveling. Traveling allows us to meet new people and create new connections. Celebrating Live Coral as the 20th Pantone Color of the Year, Pantone, in collaboration with Tribute Portfolio, a new collection of independent hotels with a unique character from Marriott International, opens the first Pop-up buffets that allow people to immerse themselves in this color in selected hotels around the world. Together, Tribute Portfolio and Pantone will present the Pantone series of interactive buffets in creative and Indian communities around the world, starting with Art Basel Miami at the Royal Palm South Beach Miami Resort, and then next year will go to Alida hotels in Savannah, Georgia, and Slaak Rotterdam, in the Netherlands. For the second year in a row, Pantone collaborates with Adobe Stock, offering a curated collection “Color of the Year” for inspiration and help for the creative community. Live Coral is a natural, but dynamic and energetic tone that is ideal for all designers who need lively and energetic, yet relaxed, creative elements. With over 125 million visual assets, Adobe Stock is a terrific resource for finding visual inspiration and creative development. The process of choosing the color of the year requires careful consideration and analysis of the trends. In order to make the right choice every year, Pantone Color Specialists from the Pantone Color Institute are combing the whole world in search of new color trends. This could include the entertainment industry and the films being shot, touring art exhibitions and new artists, fashion, all areas of design, popular travel destinations, as well as new ways of living and changes in socio-economic conditions.